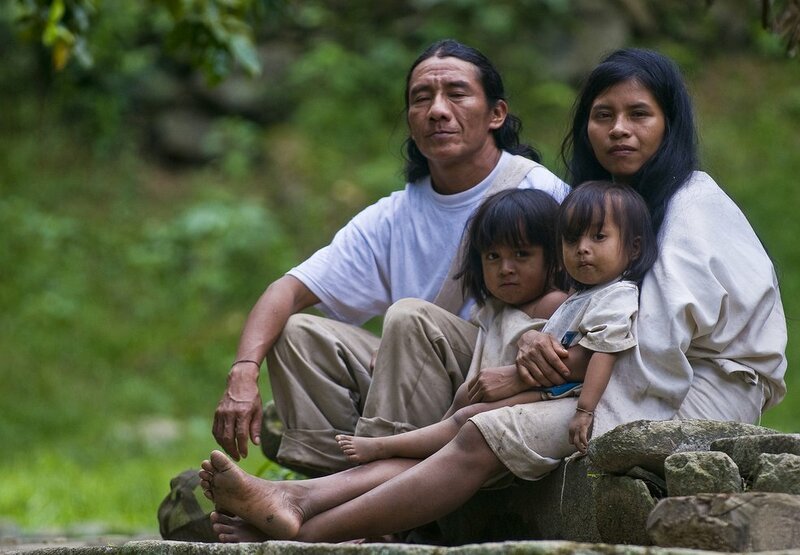 One of Colombia’s greatest appeals is its diversity of indigenous peoples. From the Arhuaco of the Sierra Nevada de Santa Marta to the Zenú of the Golfo de Morrosquillo, Colombia’s 87 native tribes represent an indigenous heritage as rich as anywhere in the Americas. While some groups are not receptive to outsiders, others welcome visitors. The following five pueblos indígenas provide an immensely rewarding way of experiencing Colombia at its most unique and intriguing. Visits to Colombia’s indigenous communities should be done with humility and utmost respect. Centuries of abuse and exploitation at the hands of Westerners—from slavery to proselytizing evangelicals and tourists who come to ogle and not to learn—has devastated their traditional cultures and left an understandable distaste and lack of trust in Western society. As a result, visitors may often experience a guarded and seemingly unfriendly reticence. The following tips will help ease your visit. Prior to your visit, verse up on each community’s history, societal norms, and contemporary issues. Be conscious that these are people struggling to maintain distinct value systems and ways of living different from, but never inferior to, our own. Treat indigenous people with dignity as equals and with a genuine smile. Remember that you’re visiting their home! Travel with an open mind and an appreciation that while lacking in material wealth and accomplishment, indigenous communities are immeasurably wise in many ways and have much to teach us. Many cultures, such as the Arahuaco and Gambianos, don’t like being photographed. Be respectful of such wishes. At the very least, ask permission before attempting to photograph. Some cultures consider direct eye contact to be rude or threatening. In communities that receive few outsiders, visit the village elder as a sign of courtesy and respect. Visit to learn and to give, not to take! Contribute to the community by buying their crafts, hiring indigenous guides, and gifting medicines or other useful items, such as pens and pencils. The majority of Colombia’s estimated 1.4 million indigenous people live in 644 semi-autonomous resguardos indígenas (indigenous reserves), scattered throughout the country. The Spanish conquest decimated Colombia’s indigenous cultures, and most groups have since suffered abuse from evangelicals, logging and mining interests, and guerrilla or paramilitary groups. Most communities that survive still struggle to protect what remains of their traditional customs and crafts; 32 groups are listed as in danger of extinction. Visiting indigenous communities is easy to do, virtually anywhere in the country. Any visit requires that you show respect for the native culture and a desire to contribute to the community’s well-being. Numbering about 150,000 individuals, the Wayúu people are Colombia’s largest indigenous group. Fiercely independent, they were never conquered by the Spanish. They occupy the sparsely inhabited Península de la Guajira, a desert region at the extreme northeast of Colombia. Most live in rustic rancherías – humble hamlets sprinkled throughout this vast, barren region – and eke out a living as goat herders and as fishers, or crafting colorful hammocks, handbags, and bracelets. Several rancherías (such as Sainn Wayúu) near the gateway town of Ríohacha are a staple for tour groups, who view demonstrations of traditional dances and weaving. For a more authentic experience, head north to Alta Guajira. The ecotourism hot spot of Cabo de la Vela is a great base and has several Wayúu hostels where you’ll sleep in a hammock or simple bed in a hut of yotojoro (dried cactus stems) and thatch. The area around Punta Gallina, at the tip of South America (and best reached by boat from Puerto Bolívar), offers the most authentic experience. Hospedaje Alexandra (at Bahía Hondita), offers rustic accommodation and filling, fresh-caught lobster meals. Here you’ll get a true appreciation for this matriarchal and polygamous society, where women paint their faces black against the sun with a mixture of mushroom juice, dust, and goat fat. Guambiano women in the market town of Silvia. 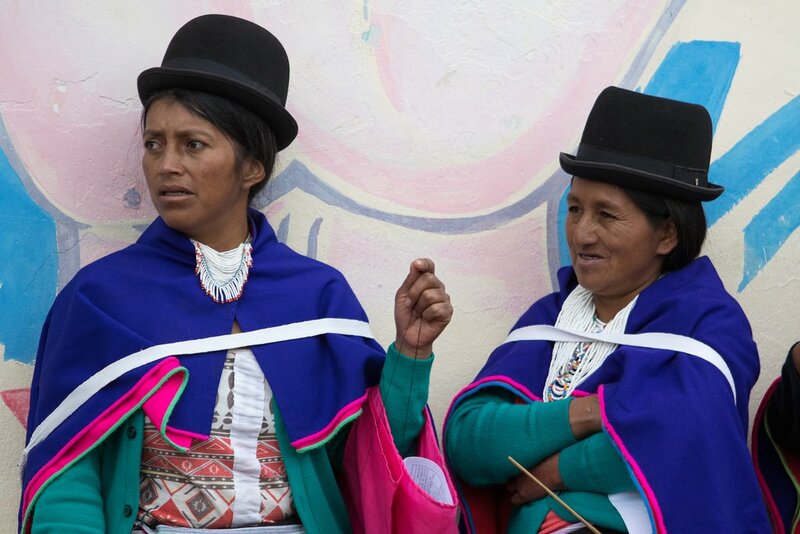 One of the most colorfully garbed and readily identifiable of Colombia’s indigenous groups, the Guambiano live in the cold Andean highlands northeast of Popayán. Also known as the Misak (and to local mestizos as “Silveños”), they number about 20,000, centered on Guambio, east of the town of Silvia. The Guambiano dress in identical fashion: The males in pink-fringed indigo-blue skirts and black ruanas (shawls); the women, with page-boy hair-styles, in black skirts and blue shawls. Both sexes wear bowler hats or pork-pie trilbys. 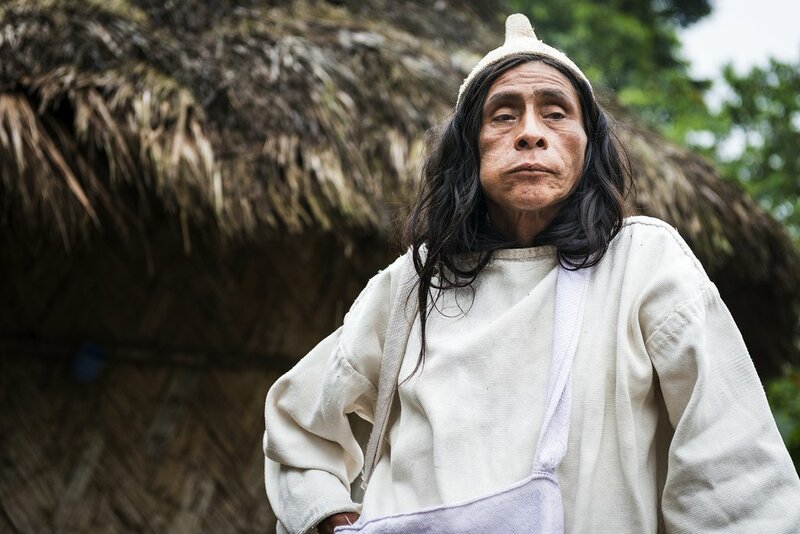 Although almost all speak Spanish, many also proudly speak Coconuco (or Wampi-misamera-wam), their traditional Chibcha-derived language, which they consider an essential source of cultural and ethnic identity. In recent decades this group suffered greatly at the hands of FARC guerrillas. Fortunately, those days are over, although the Guambiano still face considerable issues of usurpation of ancestral land by commercial developers. They grow potatoes and even raise tilapia for sale. A visit to Silva on Tuesday is recommended; this is when Guambiano flock to sell their products at the weekly market. A family from the Kogi community. The Sierra Nevada de Santa Marta bursts upwards from the coastal shore of the Caribbean and reaches 18,947 feet (5,775 m) – the tallest free-standing mountain range in the world. This rugged terrain is home to three related groups – the Arhuaco, Kogi, and Wiwa – that descend from the original Tairona culture. Virtually indistinguishable to outsides, all three groups dress in white serapes and woven conical hats, with beautifully stitched bags slung over their shoulders. The most reclusive and protective of Colombia's indigenous people, they cling tight to their ancient ways, based on a worship of nature. Most of the Sierra Nevada lies within the resguardo of the Arhuaco, the largest of the three groups. Visits are strictly controlled. On the northern flanks of the Sierra, the two official entry points are via the mountain community of Minca and the San Lorenzo Forest Reserve. You can also take the trek to Ciudad Perdida (‘Lost City’), an arduous six-day round-trip hike for the truly adventurous. On the southern flank, Pueblo Bello – the main center for of the Arhuaco community – is the official entry point to the resguardo; mamo (community leader) Luis Guillermo Izquierdo (www.fundamarin.org) arranges visits. Consider yourself very lucky and honored if you are granted permission to visit Nabusimake, the off-limits, stone-walled sacred spiritual center of the Arhuaco, accessed by a rugged 4WD track from Pueblo Bello. Almost every visitor to Leticia, the river port tucked into the far southeast corner of Colombia, makes at least a cursory excursion to a Tikuna community. Approximately 8000 Tikuna live in Colombia (and an additional 40,000 in neighboring Brazil and Peru), in about 90 aldeas (villages) concentrated in and around Parque Nacional Natural Amacayacu, bordering the Río Amazon west of Leticia. The Tikuna have been subject to decades of displacement and violence by outside forces. Plus, their traditional Shamanistic beliefs have been diluted by evangelical Christians, and only in the most remote communities has traditional dress not been replaced by Western clothing. Nonetheless, many still speak their native language and hunt with blowguns and poison-tipped darts. Exceptionally artistic, they’re known for fine basketry, mochilas (woven bags), and wooden masks and painted bark-cloth scrolls. Several communities can be visited including, notably, Comunidad Tikuna San Martín de Amacayacu. Day-tripping tourists from Leticia rarely make it here, although such a visit can easily be arranged. Far better is to plan on several days here for a more immersive experience; you can lodge at Casa de Gregorio or another local family homestay. The community arranges jungle hikes, and canoe rides in search of the boto (pink dolphin). Small World Foundation arranges volunteer visits to assist in community development in San Martín. Other Tikuna villages provide a similar experience, including the neighboring community of Mocagua. Concentrated in Colombia’s far northwest extreme, but found along Colombia’s entire Pacific litoral (and the wilds of Darién, in Panamá), the Emberá are the nation’s third most numerous group. They’re renowned for their superb basketry, and for exquisite animal carvings hewn from the tagua nut. Culturally, the Emberá are related to Amazonian tribes and speak a Chibcha dialect. Nomadic by tradition, they once lived as rainforest-dwelling hunter-gatherers without formal tribal organization. Only in recent decades have they coalesced into permanent villages, spurred by the need for protection against right-wing paramilitaries (often representing logging and mining interests) and ELN and FARC guerrillas. Materially impoverished, yet gentle and friendly, they still hunt using blowguns and darts tipped with the deadly secretions of Phyllobates terribilis—a frog whose neurotoxin is 250 times more deadly than strychnine. Travel to the Chocó region can be a challenge. Most visitors concentrate on the easily-accessible, yet landlocked coastal community of Bahía Solano. Lodges in Bahía Solano and Nuquí can arrange trips upriver by chungos (dugout canoes) to isolated Emberá communities.